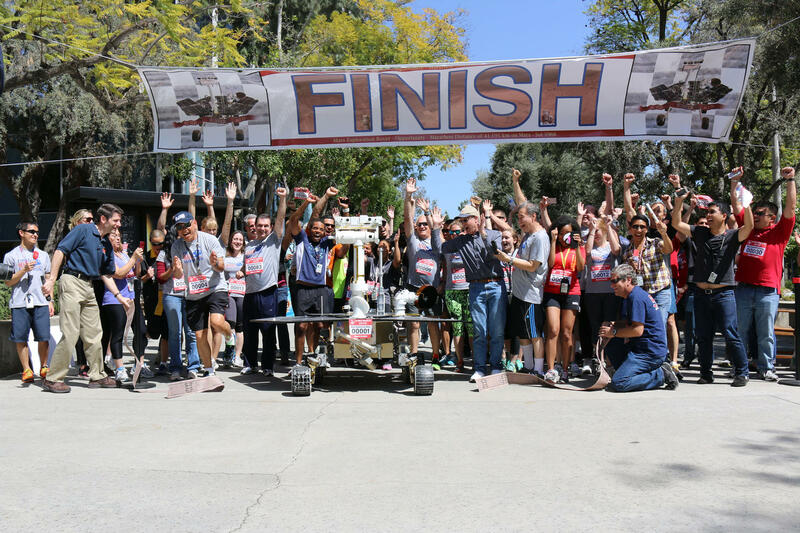 Several hundred people make the Mars Exploration Rover Mission possible. Below is a list of the project management only. Entry, descent and landing manager, Rob Manning (facing camera), hugs Richard Cook, the current Mars Exploration Rover project manager after Opportunity's successful landing at Meridiani Planum, Mars. Dr. Wayne Lee, chief engineer for development of the Mars Exploration Rover's descent and landing systems proudly waves a broom, indicating a clean martian sweep. Dr. Ed Weiler, associate administrator, Office of Space Science, NASA Headquarters and Mars Exploration Program manager, Dr. Firouz Naderi (right) are delighted with the news of Opportunity's safe entry, descent and landing on Mars. From left: Dave Lavery, program executive for Solar System Exploration at NASA Headquarters, Dr. Ed Weiler, associate administrator, Office of Space Science, NASA Headquarters, Pete Theisinger, (former) Mars Exploration Rover project manager and JPL lab director, Dr. Charles Elachi celebrate the success of Spirit's landing and transmission of first images. Members of the Mars Exploration Rover Mission's Entry, Descent and Landing team rejoice at the news that mission control received its first signal from Spirit, indicating the rover's safe arrival at Gusev Crater on Mars. Dr. Steve Squyres, principal investigator for the science instruments on both Mars Exploration Rovers, celebrates as the team witnesses the first images sent back from Spirit. Athena Science team members and other Mars Exploration Rover team members pose for a photo at JPL. This photo shows fifteen of the women engineers and scientists who work on the Mars Exploration Rover. They are standing behind or kneeling beside a precise replica of the rover in the mission control room. A team of about 50 men and women in white and blue cleanroom smocks and bonnets stand and sit around their creations: Spirit and Opportunity. The twin rovers of the Mars Exploration Rover mission are about the size of golf carts. The significantly smaller, microwave-sized Sojourner rover from the 1997 Pathfinder mission sits in the middle. Meet the people from around the world who have made contributions to the exploration of Mars.